Telecoms operator Telecel Zimbabwe just earned a huge deal of goodwill from writers by taking a copyright infringement seriously. After discovering that they had used a poem entitled Love Story by Prince Kanokanga without his permission, the company released an apology on social media. 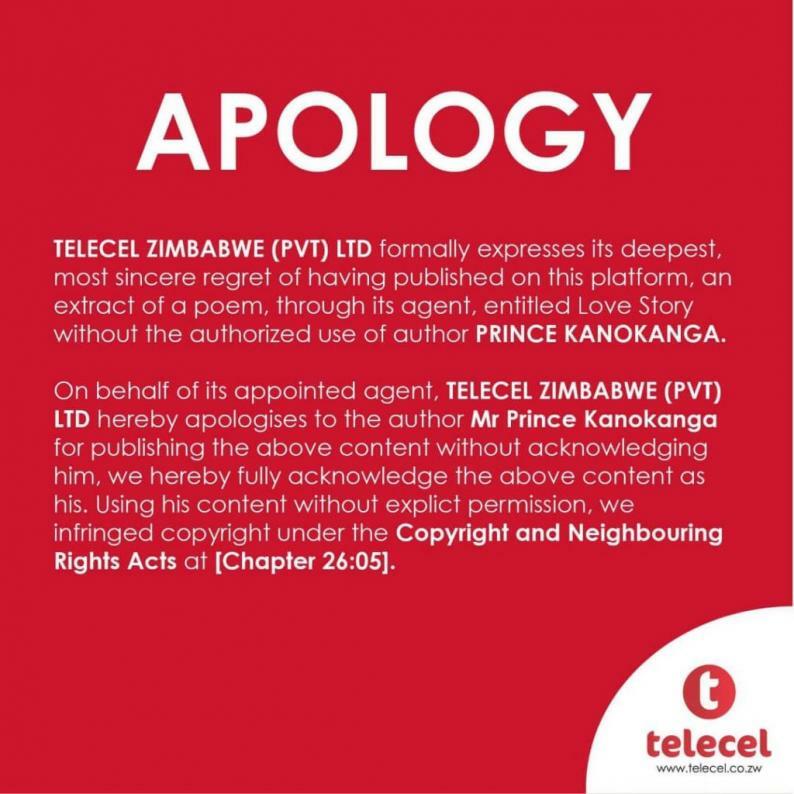 "On behalf of its appointed agent, TELECEL ZIMBABWE (PVT) LTD hereby apologizes to the author Mr Prince Kanokanga for publishing the above content without acknowledging him," read part of their apology. TELECEL ZIMBABWE (PVT) LTD formally expresses its deepest, most sincere regret of having published on this platform, an extract of a poem, through its agent, entitled Love Story without the authorized use of author PRINCE KANOKANGA. On behalf of its appointed agent, TELECEL ZIMBABWE (PVT) LTD hereby apologises to the author Mr Prince Kanokanga for publishing the above content without acknowledging him, we hereby fully acknowledge the above content as his. Using his content without explicit permission, we infringed copyright under the Copyright and Neighbouring Rights Acts at [Chapter 26:05].